This inflatable taboggan slide is made for adults and children. It is perfect for simulating a slide down a snow covered hill when winter conditions are not available. This is a massive attraction and riders board a snow tube for the ride to the bottom of the slide. It is a high throughput piece and is the only one in the United States. It has tremendous WOW factor and for many sliders, it is the only time they will ever have a chance to experience a snow tube. You simply climb up the stairs, sit in your inflatable snow tube and down you come spinning and twisting. At almost 35’ feet tall and 90’ long Snowzilla Jr. guarantees to be that winter themed slide with the Wow factor you were looking for! Climb 20’ of rugged terrain to the summit and at the top of your hike you are faced with almost 50’ of an exhilarating slide! 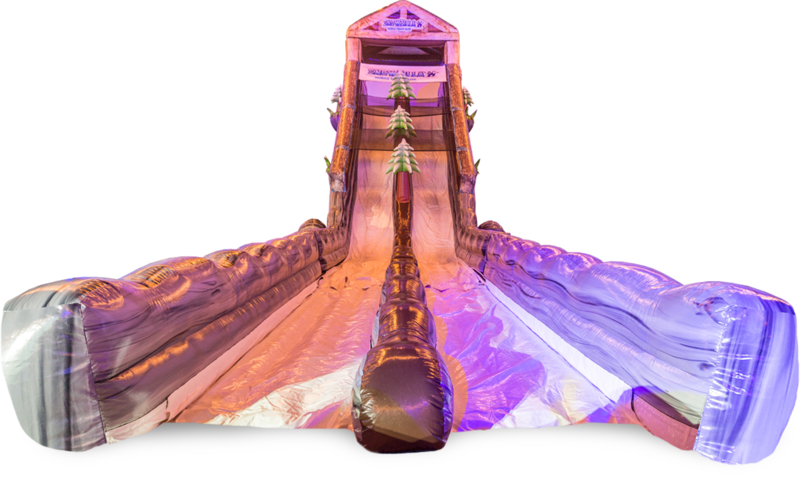 Beneath this massive winter themed slide is an enclosed jumping area moonwalk. Two attractions in one! The piece is highly visual and even has options for custom branding.